The online betting world has become increasingly competitive over the past 3 years. This is because each and every bookmaker is trying to lure in new customers to bet with them. In order for the bookmakers to do this, they have to offer these new customers an incentive for joining them and betting with them. These incentives are usually given in the form of free bets and bonuses. The mug punters out there will not be aware of matched betting and so just literally gamble with both their money and the bonuses only to lose both in the long run. However for us matched bettors, we know that the free bets and bonuses can make us money every time we place a bet! I estimate that there are at least 50 different sportsbooks that you can sign up to and complete their signup offer to make money from. I also would estimate confidently that you could make an easy £1,200 from all the matched betting signup offers that are out there. That is from just signing up to a new bookmaker and completing their new customer signup offer and moving on to the next one. Of course if you are new to matched betting, I would recommend doing all the signup offers first before moving on to the reload offers. There are a whole host of reasons for this which I will explore with you in this matched betting signup offers article. Yes you can make money from free bets! You may be asking how but from a little use of maths, you can actually convert all the free bets and bonuses that are out there into cash into your bank account. Bookmakers are always on the lookout for new customers and want them to join and start betting on their sportsbooks or casinos but they know they will have to provide them with a good offer to persuade them to join them in the first place. This is where the signup offers come in. They are designed to encourage new customers to join their sportsbook and start betting a lot of money with them. However thanks to awesome matched betting services such as Oddsmonkey, you can actually learn how to convert all these offers into cash. The good news is that it is not difficult and it does not take a lot of time to do either. If you are working already, you can complete many offers in your evening or a couple of hours on the weekend. I used to work when I first started matched betting and I still managed to make £900 on the side with matched betting around my job! I did matched betting literally in any spare time I had, I spent around an hour or two in the evenings after work or a couple of hours across Saturday & Sunday. Ultimately it comes down to how bad you want to make some extra cash to improve your finances and your lifestyle. I wanted it bad enough so I maintained my commitment for 18 months before I finally quit my old job. Let me tell you that the extra cash I generated from matched betting has enabled me to do things I would never have been able to do from just my old job alone! 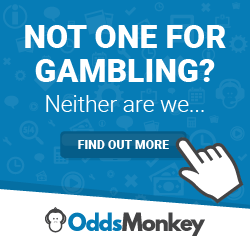 Using a service like Oddsmonkey has certainly helped me learn all there is to know about matched betting and how to make money from free bets that are out there. The matched betting signup offers are the most profitable bets you will place in your matched betting career as they are usually equivalent or double your stake. For example you may see some matched betting signup offers like “Bet £50, get £50 in free bets” so you are getting incredible value for what you are staking initially. There are some offers out there that entice new customers as big as “Bet £200 get £200”. If you keep 80% of the free bets as cash, you will walk away with £160 from just betting £200, how awesome is that? So that matched betting signup offers are the best free bet offers you will complete and that will get you off to a great start. You will quickly see your bankroll building from these new customer offers and once you have completed about 10 of them, you will see your bank grow to a very good level. So make sure you complete every possible signup offer that is out there and is available to you as you will see the benefits once you see the extra cash in your bank account. The reload offers will make you money long term but the signup offers will give your bank a quick boost which will help you when it comes to tackling the reload offers later on. I am pretty sure I haven’t completed all the signup offers yet because there are so many of them and I’ve been doing matched betting for 2.5 years! The free bets are very easy to place. They are placed in a similar way to your first bet with the bookmaker using your own money. Usually you just click a selection you want to bet on and the free bet will appear on the right side of the screen. Make sure you click “use free bet” once you receive the free bet and it will be used on the selection you choose to bet on. The free bets are where the money is made. As I have mentioned in a previous article, matched betting is a two step process. The first step involves placing a qualifying bet and the second step involves converting a free bet into cash. So you should never really expect to make money from the qualifying step and if you manage to make money from this stage, you could be “arbing” which is a quick way to get your accounts limited, so avoid arbing and arbitrage at all costs. The second step involves using a free bet at high odds of 4/1 (5.0) or above to guarantee a profit and this is where the money is made. So free bets are best placed on selections which are underdogs or less likely to win which means their odds will be higher. With free bets, the higher the odds are the money profit you will make from the free bet. But of course with higher odds, the liability you need your exchange account will be much higher so ensure you can handle the liability before you place the free bet with the bookmaker. From the qualifying step, you would normally expect to make a few pennies loss but you don’t need to place bets with high odds. To reduce your loss as much as possible, it is best to find the closest possible match on the oddsmatching software that is available at Oddsmonkey. This will ensure you are doing matched betting at a very profitable level and will also make you more money from the free bets that come from the matched betting signup offers. The free bets offers that bookmakers offer us are a great way for us to make money. Just from signing up to the many well known bookmakers out there, we can guarantee a profit for ourselves rather than gamble our money and potentially end up losing it all. However, you must learn how to do this and Oddsmonkey have put together a fantastic website which teaches people of all matched betting levels how to extract profit from these free bets offers. I can say that without a service like Oddsmonkey, I wouldn’t have made as much money as I have done and I am pretty sure I would have made many mistakes without their help and tutorials. In the matched betting game, mistakes can be costly and it is much better to pay £15 a month to use their service than go it alone and potentially make many mistakes which would cost more than £15 a month! All the free bets offers that are worth doing, they will be posted to Oddsmonkey’s site just waiting for you to take advantage of. You can also try their free trial and get a glimpse of what these free bets offers are like and how you do actually make money from. I was very curious at first when I heard about matched betting and I completed the free trial to see how money was made from the free bets offers. Once I saw how, I was hooked and became obsessed about this way of making money. The free trial walks you through two of these free bets offers and then the premium £15 a month has many of these free bets offers where you can make an easy £1,200 from just signing up to all the many different bookmakers that are out there. To take advantage of the matched betting signup offers and to make money from the best free bets offers out there, I would recommend joining, read my Oddsmonkey review here. You will receive expert tutorials and be in the best place to make money from these free bets offers and turn the free bets into cash.